You’ve chosen a puppy, bought supplies, puppy-proofed your home, and established some household rules. Now it’s time to bring your new puppy home. Of course you’re excited and eager to start this new bond, but try to imagine what this is like for the puppy. He’s just been taken from his mother, siblings, the only humans he knows, and his familiar environment. This can be scary and confusing for a puppy, but there are several things you can do to help him adjust to his new life. Your first instinct may be to bring him in the house, let him explore and immediately meet his new family. But, take things slowly. Choose a potty spot: Start by taking him to the outside area where you want him to go potty. If he does relieve himself, use a command that you’ll stick to, like “go potty” or whatever you’re comfortable with and remember to praise him. Introduce him to his new home: You’ve already prepared a puppy-proof area of your house, right? This is where you’ll bring him. Many people erroneously think they should just let the puppy loose to explore the house at will, but this is a sensory overload. Too many new places, smells, and people at once may just confuse him.Instead, let him explore a designated area. Perhaps where his food and water are. Or he can familiarize himself with the small, puppy-proofed space where you’ve placed his crate. Let him get used to this space before you go on further exploratory missions. Then introduce him to the rest of the house, one room at a time, skipping the rooms you’ve decided are off-limits. Introduce him to his new family members: Preferably one person at a time, although this will be difficult with all the excitement about a new puppy. But try to give him a chance to meet each of you quietly. 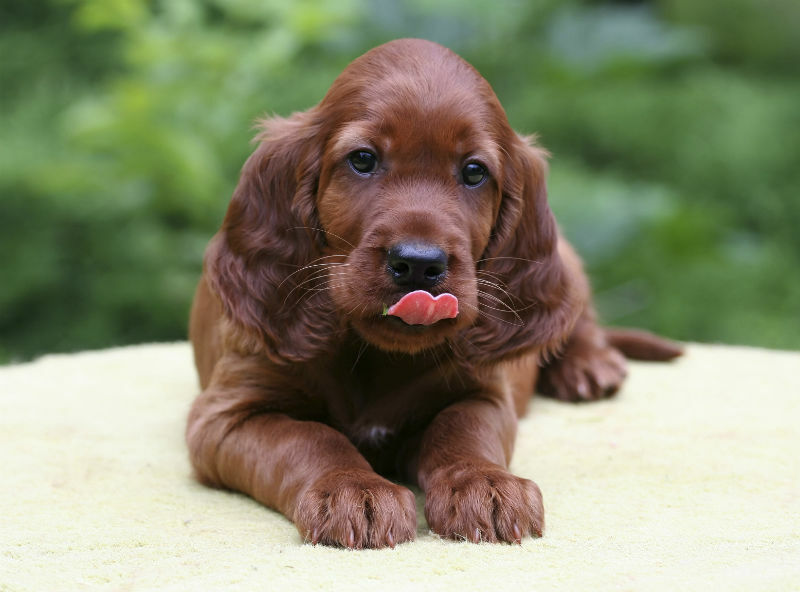 Puppies like to chew: Provide appropriate and safe puppy chew toys for him, and if he starts to chew on anything else, redirect him to his chew toy. Here are some other tips about living with a chewing puppy. Show him his sleeping place. 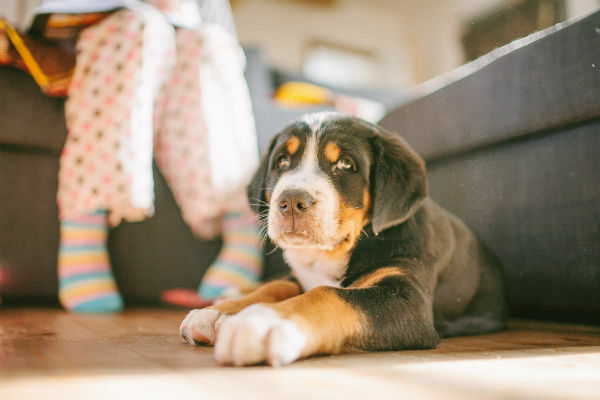 Puppies sleep between 15-to-20 hours a day, and although they’re often likely just to drop in their tracks, bring him to his crate or dog bed when he seems to be ready for a nap and at bedtime. Contrary to what you may think, crates are not “doggie jail.” Dogs prefer the security and safety of a den, and this crate will become his safe place, with some encouragement. Keep a close eye on your new puppy. He should be supervised or at least within your vision in his “doggie den” at all times during these early days. Take him with you from room to room, giving him a chance to explore under your watchful eye. Start enforcing rules. Although it may seem too early to you, he needs to learn the house rules from the very beginning. The more structured and consistent his day is, the better adjusted and happier he’ll be. Whether it’s chewing or any other behavior you don’t want to encourage, use gentle redirection. Yelling at him or punishing him will only frighten and confuse him, not teach him. Remember that he is only just starting to learn what’s expected of him. Praising good behavior and deflecting unacceptable behavior is an effective way of helping him learn. Most of all, take things slowly. Gradually expand his environment, under your supervision, of course. With lots of affectionate contact with the family, consistent rules and routine, rewards for good behavior, and gentle corrections for unacceptable behaviors, he’ll quickly learn his place in his new “pack.” Not only that but, And most importantly, as he adjusts to his new environment, you will establish a bond that will endure throughout his life.